Walhalla Main Library–Mondays at 10:30 a.m.
Salem Branch–Tuesdays at 10:30 a.m.
Westminster Branch–Wednesdays at 10:30 a.m.
Seneca Branch–Thursdays at 10:30 a.m.
Walhalla Main Library–Mondays at 3:30 p.m.
Salem Branch–Tuesdays at 3:30 p.m.
Westminster Branch–Wednesdays at 3:30 p.m.
Seneca Branch–Thursdays at 3:30 p.m. STEAM Ahead Story Times will end for the summer after 4/25/19, and resume in the fall. 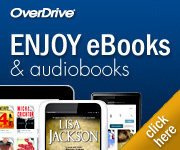 The library has ebooks and audio books to download through OverDrive digital media. Check it out at https://oconee.overdrive.com/. The library also has DIGITAL MAGAZINES through Flipster. Internet is not available for final 30 mins (15 mins in Salem) that the libraries are open.